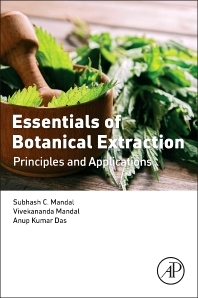 Essentials of Botanical Extraction: Principles and Applications provides a unique, single source of valuable information on the various botanical extraction methods available, from conventional to the use of green and modern extraction technologies including ultrasounds, microwaves, pressurized liquids, and supercritical fluids. Most extracts obtained from botanicals are often poorly characterized with unidentified active or inactive constituents. A wise selection of an extraction strategy is vital to drug discovery from medicinal plants as extraction forms the basic first step in medicinal plant research. This book also explores the mathematical hypotheses and innovations in botanical extractions and analyzes different post extraction operations so that dependency on serendipity is reduced and the same be converted into programmed drug discovery. Dr. Subhash C. Mandal, a Professor at the Division of Pharmacognosy, Department of Pharmaceutical Technology, Jadavpur University, Kolkata, India, is one of the world’s leading Pharmacognosy and Phytotherapy researchers with research emphasis on Indian traditional medicine and botanical extraction. Professor Mandal is the recipient of many prestigious awards including Endeavour Research Award, Government of Australia; Distinguished Education & Research Award, AAiPS, USA; Talented Scientist Award, University of Colombo, Sri Lanka; SAARC Fellowship Award, University Grants Commission (UGC), Bangladesh; Fast Track Young Scientist Award, DST and UGC Research Award, India. Professor Mandal has supervised more than 30 doctoral and 20 M. Pharm scholars and has more than 260 research publications, several patents, and books to his credit. Professor Mandal has delivered more than 50 research presentations around the globe, has chaired many international conferences, and successfully completed more than 10 government-funded research projects. Professor Mandal is the reviewer and board member of several high-impact journals and is a recognized host scientist for many international research programs with developing countries sponsored by the Indian government. Dr. Vivekananda Mandal, an Assistant Professor at Guru Ghasidas Central University, Bilaspur, India, is one of the young researchers in Pharmacognosy with research emphasis on botanical extraction and Phyto-analysis. Dr. Mandal is a gold medalist from one of the premier institutes of India, IIT (BHU). Dr. Mandal is also the recipient of the International Fellowship from Wakasa wan Energy Research Center, Government of Japan, for an advanced research program on innovations of atomic force technology for cancer drug discovery at National University of Fukui, Japan. Dr. Mandal has several high-impact research publications, book chapters, and patents to his credit apart from government-funded research projects. Dr. Mandal is also involved in technology transfer process with industries. Dr. Anup Kumar Das was a Senior Research Fellow for his doctoral program under the Council of Scientific and Industrial Research (CSIR) project at Jadavpur University (Department of Pharmaceutical Technology). Dr. Das is currently working as a Research Scientist in Mumbai, India. Dr. Das is a gold medalist in his B.Pharm (North Bengal University), and was also nominated by the University Grants Commission (UGC) for the prestigious Commonwealth Split Site Doctoral Scholarship-2014 tenable in the UK. Dr. Das has high-impact research publications and a patent to his credit.